I can’t say it enough: This book really is awesome; I only hope the publisher is able to release a more affordable paperback copy so more folks can use the book. It is that useful if you’re working through the text of a passage and want to take significant variants from early manuscripts (pre 5th century) into account. . . .
For this task, Part II, “The Manuscript Tradition” is really the gem within the book (TOC for Part II is given in a previous post). While each article approaches the task differently, what you end up with is basically a focused discussion of the variations found in early manuscripts (mostly papyri) for a given NT book. 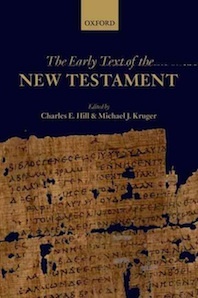 If you are working with the text of the NT, this really is essential material to consult. If there are significant issues with the early witnesses for a section of text you’re working with, it will likely be discussed in this book. I'm working through this right now and finding it very helpful as well. And I echo Rick's hope that a cheaper paperback might be released. Also I noticed Peter Head's chapter on Mark was very short--a reflection of how little material there is for poor Mark in the early centuries. Sorry Rick. That link was supposed to be included in the post but it accidentally disappeared. The shortness of the chapter on Mark is also a reflection of the fact that I had a battle of wills with the editors ... and lost. This is an example of the priority of the (lost) longer original to the extant shorter version. This could have significant ramifications for the Mark 16 debate. Yes, if I was in charge the book would be twice as long, twice as expensive, and ten years late. Peter's comment ("The shortness of the chapter on Mark is also a reflection of the fact that I had a battle of wills with the editors ... and lost") rings a familiar bell. The same thing happened to me in the Rethinking NT Textual Criticism volume, where the publisher (not the editor!) also won the battle of wills and forced not one 25% cut, but after that demanded a further 50% cut -- after which I chose to write only a short summary, with a link to the real essay on the internet. I have purchased books over others of the same subject simply by the page length (does anyone else do this?). Dr. Robinson, I own a copy of the Rethinking NT Textual Criticism volume and loved it, especially Epp's paper (it is on my nightstand). In an earlier reading, I missed your footnote referencing your longer treatment in the TC journal. Thanks for pointing that out, I look forward to reading it! Timothy M: "I missed your footnote referencing your longer treatment in the TC journal." You're not alone....At least one reviewer in a recognized journal (CBQ) also missed the footnote, and was quite apologetic after the situation was pointed out to him. I must unfortunately admit that I often do not read footnotes. I have read Royse' magnum opus, but I largely skipped over the footnotes. I intend to re-read the work in the near future and pay closer attention to the footnoted material. Gospel of Jesus' Wife – Final Death Throes?